We had walked into the cheese shop from a brisk foggy cold. Pulling off our layers, we noticed the small shop was bustling with folks tasting cheese and sipping wine. Stepping down into the main area of Kaashandel Abraham Kef, we were greeted by a friendly woman who asked if we wanted to try some "khh-howda". It sounded like "chowdah," said a la Boston, and replacing the "ch" with a guttural, throat-clearing "khh" sound. Momentarily confused, I turned to my friend Kirk, who was smiling and gesturing to the large wheels of cheese on the wall. Then, it dawned on me, although it didn't seem polite to pronounce "gouda" the way we do in the States ("goo-dah"). She was preparing cheese plates for the seated customers and gave us shavings of gouda. Some were aged, some very young, and one mixed with kruidnagel. In English, another woman told us she couldn't remember the name of the spice, but it was a small, woodsy, and was shaped like a stick with a ball at the end. Kirk and I went back and forth before he remembered, "Cloves!" 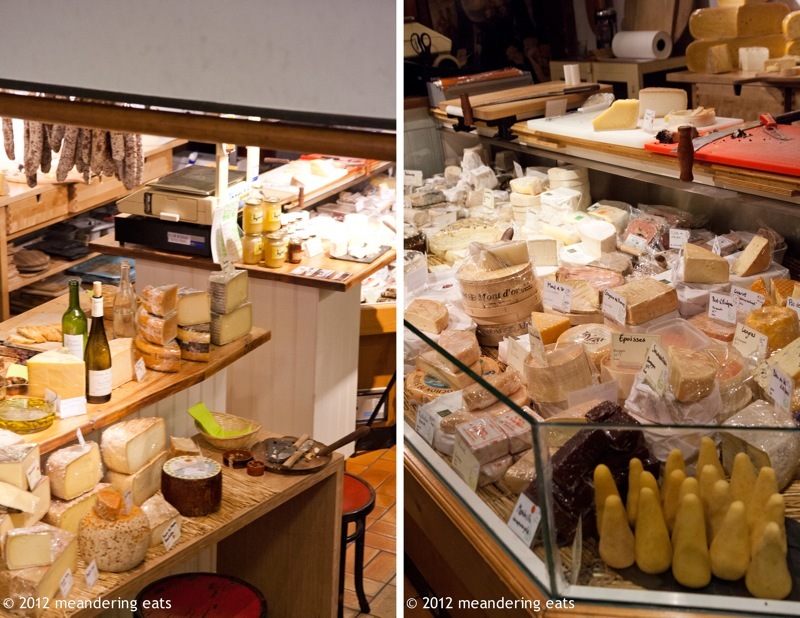 As Amsterdam's leading French cheese shop, there were plenty of beautiful French cheeses on display. Since we came from Paris, we had zero interest in the French cheeses and focused on the huge wheels of gouda on the shelf. The owner worked deftly while chatting to us about Dutch gouda, of which there's a proud tradition. 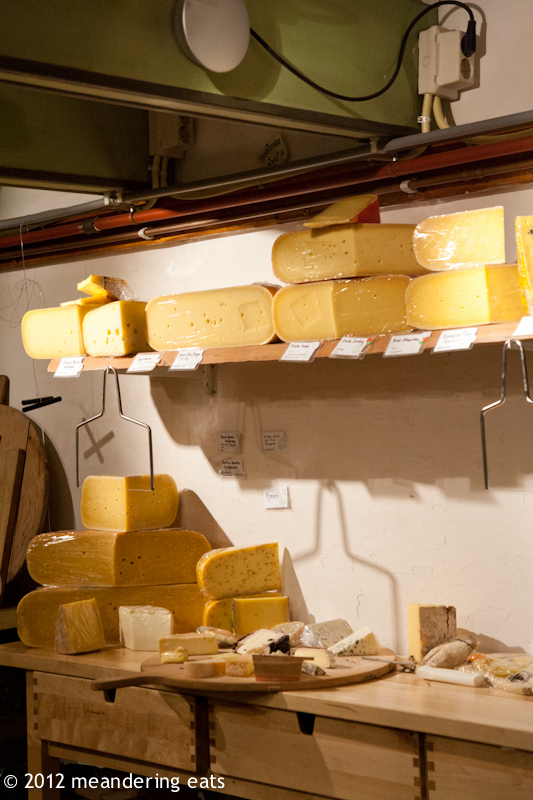 From the method to the milk, there's plenty of history entrenched in gouda. She warned us never to buy the little packaged wheels of gouda found in souvenir stores. "Oh, no, don't buy those. It's for tourists." The cheese shop was too crowded for us to stay and snack, so we decided to buy some cheese and take it back to Kirk's apartment. We settled on a 10-year-old gouda and the one with the cloves. Expertly, she plopped a gigantic part of a wheel on the board and sliced us a wedge with the wire. My jaw dropped. The wedge was about an inch thick at its widest, but it was an effin' slab about 4 inches wide and nearly 10 inches long. There were two of them, plus a baguette. Dan's eyes widened and we were wondering how much the cheese would cost. Food was not cheap in Amsterdam. We gaped at her. With the generous slices she gave us, that was an absolute steal. We paid and rode our bikes back to Kirk's apartment, where we ate enough cheese to send Wallace into a bender. Here in San Diego, Dutch cheeses are a possibility, but the quantity and selection are what one expects from a city thousands of miles and a continent away from the Netherlands. We have excellent sources of cheese, though, with the fabulous Venissimo, farmers' market staples like Taste Cheese, and the expansive cheese selection at Whole Foods. Cheese is an excellent way to bring your travels home, so why not put together a cheese platter? I like to do it for all gatherings and, yes, there will be a cheese plate at our Super Bowl party. Who cares if it's not necessarily "football food"? 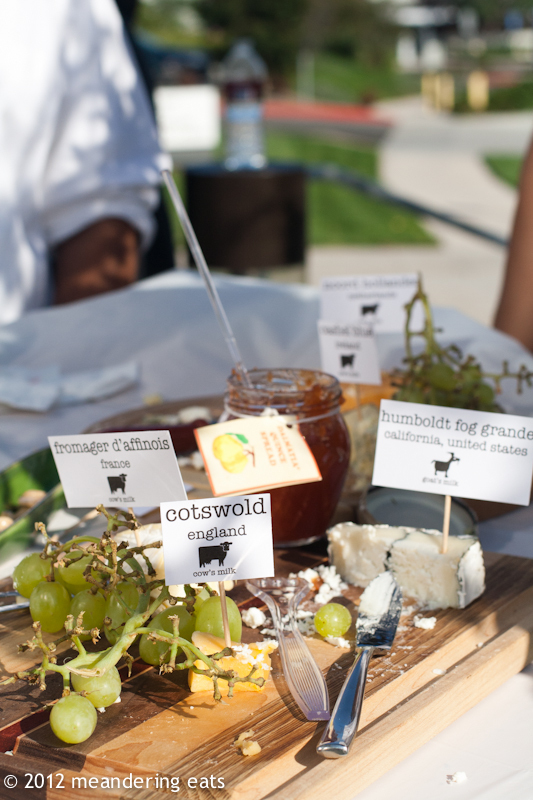 If you're going to feature a cheese platter this Sunday, little labels stuck into each wedge with toothpicks are helpful and save you from explaining each cheese over and over. Fruit like grapes and apple slices complement many cheeses and I find that fig jam goes exceptionally well with many strong cheeses, especially blue cheese. 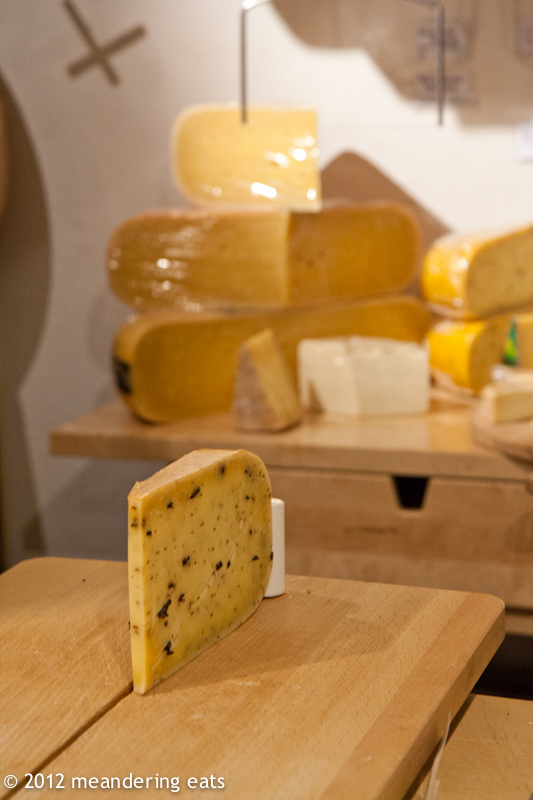 I can see why you didn't stay at the cheese shop: every possible surface is overflowing with cheeses! It would be so hard for me to choose amongst all that cheese! Mmm! I was in the kitchen with Mary from taste on Wednesday and she gave me a sample of a delicious aged Gouda with those caramel tones and salt crystals. She pointed out that this would be an excellent valentines gift for my dear hubby! I love these posts about your Amsterdam travels. We were there so briefly, and did not visit a cheese shop :( One of the cheese shops around here sells aged gouda--it has those little nubbly, almost gritty bits in it and it is really, really good! You could take away chocolate, but never cheese--neither one are doing much for the waistline, so I am vicariously enjoying gouda from your post for now. And furthermore, your photos look great!! Dan and I occasionally do a couple hunks of cheese, crackers, and wine for dinner. Not the world's most rounded meal, but damn good. I am absolutely loving this post Marie! My parents live on a half dutch, and half french island. The cheese is one of my fondest memories from there. I could totally hear in my head the correct pronunciation of Gouda as I was reading it. 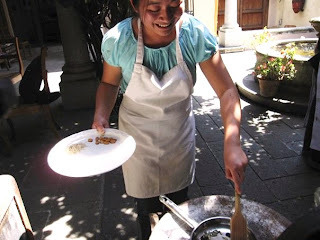 Okay, and you really have me wanting to make a cheese board tonight instead of Tostadas for dinner. :D.